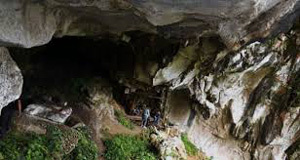 In the west part of Tana Toraja Regency, there is a famous cave called Lo’ko Ledo. Today, it becomes one of tourist attractions in South Sulawesi Province. The cave features both stalagmite and stalactite. It is a serene cave, so you won’t expect many people and noises there. Somehow, it gives you a peaceful feeling when exploring the cave. One thing, tourists should come with a tour guide in order to explore the cave safely. It is because only the locals know the route. Once you get in the cave, you can see nothing but darkness. Thus, it is better to carry a flashlight. Both stalagmite and stalactite are the main features of the cave. They look beautiful and unique. It also becomes your opportunity to take pictures of those natural attractions. Some parts of the cave are slippery, so you should watch your steps. Caving is quite popular activity, but any explorers should have prepared beforehand. At least, beginners should not act carelessly in the cave. For adventurers, Lo’ko Ledo Cave is definitely a good destination. It is a challenging and worthy place to explore, after all. Today, the cave becomes a recommended nature tourist spot in South Sulawesi Province. The locals call it the cave of the bats (Gua Kelelawar). Like the name suggests, many bats live in the cave. They only come out for hunting at night. Thus, you can see them hanging on the roof of the cave at noon. Make sure not to disturb them, though. Apart from witnessing the bats, you can do many other things. For instance, you can enjoy stunning views of the nearby scenery. A sight of the mountain and green hills are indeed attractive. They will make you comfortable, for sure. Due to this wondrous sight, tourists also spend a good time in Lo’ko Ledo for relaxing. Still, it will be a waste if you don’t explore the cave. For a merrier moment, you should come with friends or families. Not to mention you must come with a local guide. Lo’ko Ledo Cave is considered an isolated location. Not many people are seen there. For beginners, it is better to come with an expert. This way, you can explore the cave efficiently as you use the right route. Another important thing is related to the equipment. Proper footwear, clothes, and a flashlight are compulsory. Make sure to carry some money as you may use it for renting a local tour service. For a cheaper price, you need to learn how to bargain. Lo’ko Ledo Cave belongs to Tana Toraja Regency. You can reach it from Makassar City by taking Poros Barru – Makassar Street. The whole trip takes up to 8 hours and the distance is 315 km. For those who come from Jakarta, your destination is Hasanuddin Airport in Makassar. Once you get there, you can simply take either a taxi or other local transportation services to the final destination.